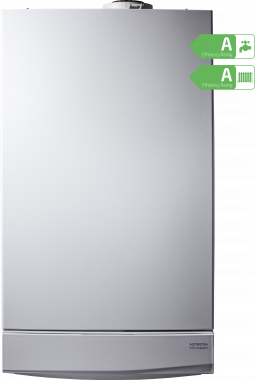 The wall-mounted Potterton Titanium 24kW combi boiler is A-rated for efficiency with a SEDBUK 2009 rating of 91.10% (A). Better still the British built boiler comes with the manufacturer's 7 year parts and labour warranty as standard to give you complete peace of mind. Part of the Potterton Titanium range of combi boilers the Potterton Titanium 24kW boiler is ideally suited to supply heat and hot water to flats and small houses. For larger properties and in the case of higher hot water demand outputs of 28kW 33kW and 40kW are also available in the range. It's a versatile boiler meaning there's an option to suit every home and its heating and hot water needs. It's neither the smallest boiler on the market (it measures 78x45x35) or the lightest (at 43.6kg). However the wall-mounted Potterton Titanium boiler range is designed to fit inside most standard cupboards or between kitchen units. Features include a 24 hour clock as standard a stainless steel heat exchanger and simple to use controls so you can control your heating and hot water separately. The Energy Savings Trust recommend this boiler.